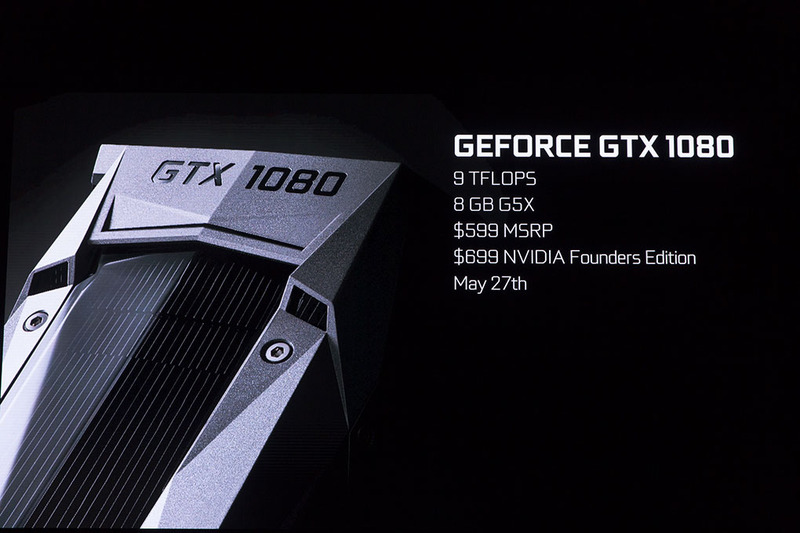 AUSTIN, TX – May 6 2016 – NVIDIA today announced the NVIDIA GeForce GTX 1080 the first gaming GPU based on the company’s new Pascal architecture — providing up to 2x more performance in virtual reality compared to the GeForce GTX TITAN X.
Next-Gen GPU Architecture- Pascal is optimized for performance per watt. The GTX 1080 is 3x more power efficient than the Maxwell Architecture. 16nm FinFET Process- The GTX 1080 is the first gaming GPUs designed for the 16nm FinFET process, which uses smaller, faster transistors that can be packed together more densely. Its 7.2 billion transistors deliver a dramatic increase in performance and efficiency. Advanced Memory- Pascal-based GPUs are the first to harness the power of 8GB of Micron’s GDDR5X memory. The 256-bit memory interface runs at 10Gb/sec., helping to drive 1.7x higher effective memory bandwidth than that delivered by regular GDDR5. Superb Craftsmanship- Increases in bandwidth and power efficiency allow the GTX 1080 to run at clock speeds never before possible — over 1700 MHz — while consuming only 180 watts of power. New asynchronous compute advances improve efficiency and gaming performance. And new GPU Boost™ 3 technology supports advanced overclocking functionality. Groundbreaking Gaming Technology- NVIDIA is changing the face of gaming from development to play to sharing. New NVIDIA VRWorks software features let game developers bring unprecedented immersiveness to gaming environments. NVIDIA’s Ansel™ technology lets gamers share their gaming experiences and explore gaming worlds in new ways. Enveloping Audio: VRWorks Audio uses the NVIDIA OptiX ray-tracing engine to trace the path of sounds across an environment in real time, fully reflecting the size, shape and material of the virtual world. Interactive Touch and Physics: NVIDIA PhysX for VR detects when a hand controller interacts with a virtual object, and enables the game engine to provide a physically accurate visual and haptic response. It also models the physical behavior of the virtual world around the user so that all interactions — whether an explosion or a hand splashing through water — behave as if in the real world. Cannot wait to get my hands on one, really looking forward to gaming after installing this bad boy! K.